According to the AP, the ranks of the Scouts of America is only half the size it was a generation ago. The organization, which has only 3% Hispanic participation in a country, has undertaken a new initiative to appeal to this demographic in hopes of regaining its prominence. Since one in four Americans under five is of Hispanic descent, this seems like a logical move. To this end, the Niño Scouts is taking a two pronged approach: a rebranding campaign and revised programming that speaks to this population. To lead the rebranding effort, the BSA has hired the PR firm of Fleishmann Hilliard, and created its own branding and marketing departments. (A snarky journalist might suggest these groups are tasked with the BS of the the BSA.) Expect to see radio and TV ads for the organization later this year. Programs will also be overhauled. Look for bilingual leadership and materials, and more emphasis on the urban and the family experience. 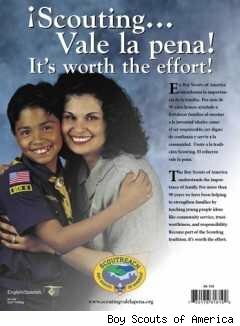 The BSA is launching pilot programs this year in several towns with large Latino populations, and has already translated a great deal of leadership material into Spanish. Don't expect outreach to gay or atheist youth, however. Leaders in these minorities are still no deseados in the Scouts.